Star Wars fans have been eagerly waiting for Force Friday (Friday, September 4th) for a while now. For those of you who don’t already know, that is going to be when a huge batch of new toys and merch will be revealed for the upcoming Star Wars: The Force Awakens movie. These toys could reveal more details about the movie too, so the tension is high. 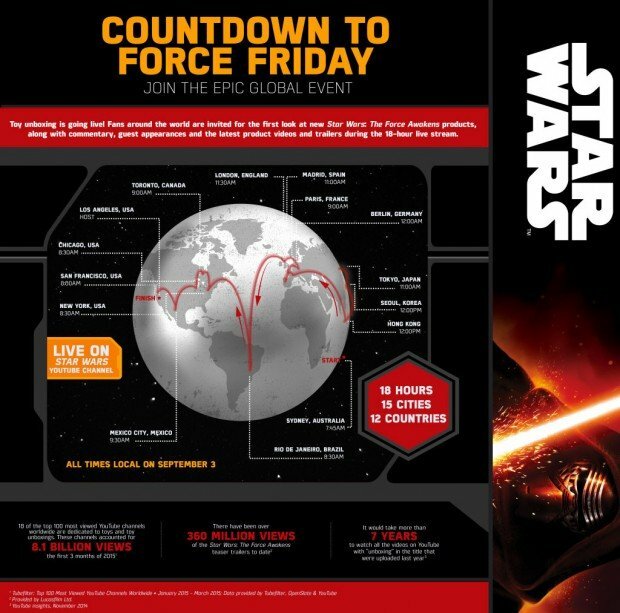 However, according to Disney, we won’t have to wait until Force Friday to get a look at those new toys. Maker Studios will be hosting an 18-hour unboxing event on September 3rd at 5:45pm EDT, with different personalities around the globe each unboxing a toy, and broadcasting the experience live on the Star Wars YouTube channel. This is certainly a first. Fans are going to love it. You can find the full schedule at StarWars.com. The preview video is below.